Come the summer holidays everyone in my family is on duty. Various nephews and nieces are shuttled from house to house and this week it has been my turn, hence the paucity of posts! Today, the photographs come courtesy of my 10 year old nephew and 7 year old niece as does the food. 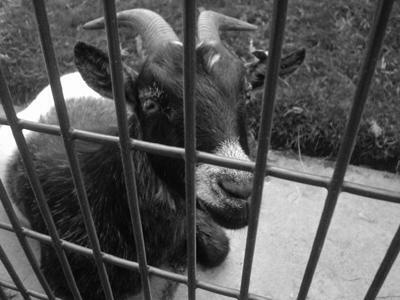 First up is a fine pic of a goat at a city farm and secondly the penne with meatballs we made this afternoon. Fine photographers and burgeoning cooks the pair of them! These are some very good, if slightly misshapen pork and beef meatballs that we put together over the course of the afternoon. Kids will eat anything they have participated in cooking, and they seem to enjoy it, of course, they could be humouring their old uncle. They are a pretty canny pair. Photos were very arty and the kids did a great job on the recipe too. There is something rustic and 'real' about misshapen meatballs. It makes it clear to everyone that you've made it yourself. Nice work! Oh rats. I'm throwing away my camera. Those are great pix. Your congratulations have been passed on! Thanks guys. And cookie thanks for the sweet words, steal away by all means! Like cookiecrumb said, I love your new site design too, it's really cool! 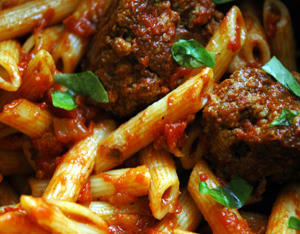 Oh, I love meatball pasta, I usually use sausages though!